Yes, Suzhou, Venice of the Orient. Where rampant construction has not yet touched this pristine and beautiful country, tourism has arrived, and in the best way possible. I shall begin, with the picture of the street outside the Humble Administrator’s Garden. Ah yes, The Humble Administrator’s Garden, 拙政园, a beautiful garden, full of life, beauty and more that cannot even be stated in words alone. The entrance fee of 70RMB aside, it is truly a sight to behold one of THE reasons to even visit Suzhou. What is so special about this garden, is probably its size, its variety of flora, and the way which all this beauty comes together in glorious harmony. We in Suzhou are blessed, truly blessed to hold one of the world’s treasures, treasure it we must. 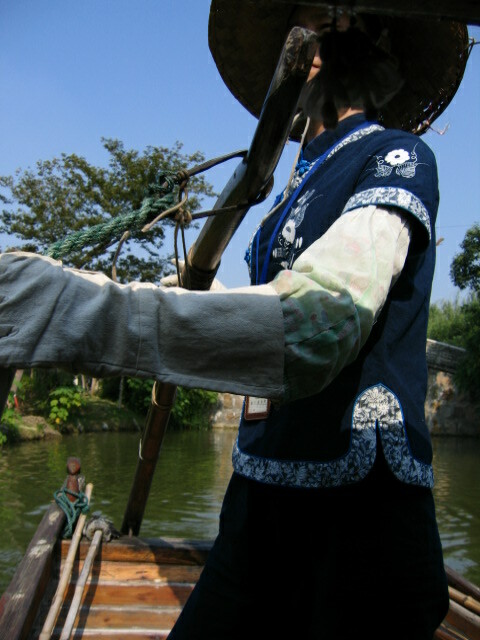 The above picture of a tea house, is typical of such Chinese gardens and can be found almost always filled with smoking Chinese men and women, a performer, in this case a person playing a Chinese instrument and singing in the local dialect. A feature of the Chinese garden which often surprises people is the common appearance of buildings, this can be a little disconcerting for the average non-local. However we must remember that these gardens were meant for private use in the past and often was integrated into the houses of the Elite in Chinese society. Something which I found extremely beautiful which is rather unique to 拙政园 is the number of lotus plants there, in the ponds. I thought it provided so much green and was incredibly pleasing to the eye, no wonder Monet loved painting his Lotus plants! Bamboo, Bamboo lined up all against a wall, totally reminiscent of the scene from Crouching Tiger, Hidden Dragon, in the Bamboos dancing rather than fighting in those leaves. You can almost hear the HIYA-ing and the rustling of leaves. We leave the garden with this picture of what to me truly is the Humble Administrator’s Garden, Tourists, Lotus plants, Nice old Buildings and a serenity that seems to be a snapshot in time. We move on to Tiger Hill, arguably Suzhou’s No. 1 tourist spot, though oddly enough, and all the better for me, dear readers, a much better place to go to. 虎丘, has been over the years known by different names, in the past because of its proximity to the ocean, because of an Emperor’s desire. We know it as 虎丘, simply because of a story, that as an Emperor was being buried in a tomb on Tiger Hill, a White Tiger was sighted passing by, the locals believed that this Tiger was the reincarnation of the Emporer, and renamed this Hill, Tiger Hill. A story much more interesting on the hill itself, with a bubbly 20-something tourguide telling it to you. Here is a picture of me and my 6th Uncle at the base of this Hill of 36 metres in height at its summit. Directly behind us is the actual entrance of the hill, and behind that some metres up is this beautiful rock, named the 1000 Persons rock. This rock, as with most famous rocks that housed tombs in history is named thus because it required 1000 people to carve into such a beautiful shape and condition. The Emperor as is most Chinese Emperors in history was afraid that these people would tell others about the location of his tomb and his 宝剑, *Why should he care about his treasured swords! He’s DEAD! * Either way, he had them slain, and that is why, we have the name 1000 Persons rock. In this beautiful picture… of the scenery, we see a beautiful rock formation, shaped in a sword. This formation, is there simply because of the treasure it hides. The aforementioned Emperor’s 宝剑. He hid them underneath the water, the fishies, in a sword shaped formation… Hm, why no one caught on is beyond me. Darn, or they did and didn’t tell me bout’ it! This next picture is really unique. It is essentially the Leaning Tower of Pisa in China! Yes another Italian reference, wonder if its something in the water, first Venice then their tower, next thing, you know they’ll be taking their noodles as well! This picture shows the tilt more obviously and also throws in some of that beautiful greenery that we rarely see anywhere anymore. Next we come across the 定园，strangly AKAed as the Calm Garden, nevertheless it is something special. Within the wall of this garder are these nice little boats where all the propelling power is provided by women, slim slender Chinese women, who sing as the row along, with 7 people in their boats, HA! See, we, Chinese people whup the asses of those smancy pants Venetian Gondoliers! This garden is truly quite beautiful. The difference is it has this nice river within it, so there is slightly less flora here than at the Humble Administrator’s. However there is a charm similar to 周庄, right here in the middle of Suzhou. 周庄 for those of you in the know, i.e. living outside of China, is that little town where they shot the whole Tom Cruise screaming ZHOU KAI scene in MI:3, in what must be the most Lao Wai accent you can think of at the hapless Chinese people whose only sin was smoking copious amounts of ciggies and spitting. This little garden was where I ended my tour of Suzhou, in a little garden not well known to tourists, but extremely beautiful and definately with its beauty, its flaws hidden by its stunning colours, tastes, smells and textures.